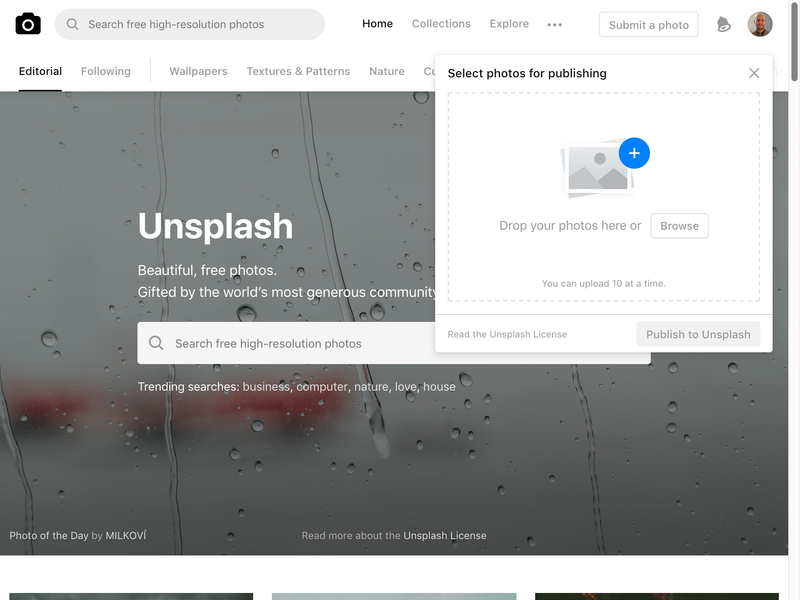 At Unsplash, we just released a brand new version of the photo uploader. 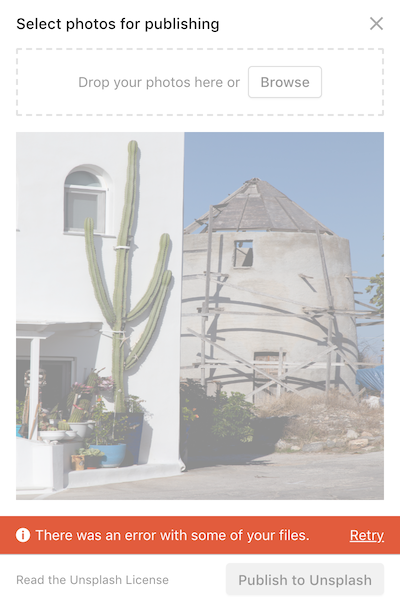 The new uploader has a very simple design, but looks are deceiving! Under the hood, there are lots of different possible states and edge cases to consider. In this article, we’ll provide an overview of the technical architecture and discuss challenges we faced along the way. 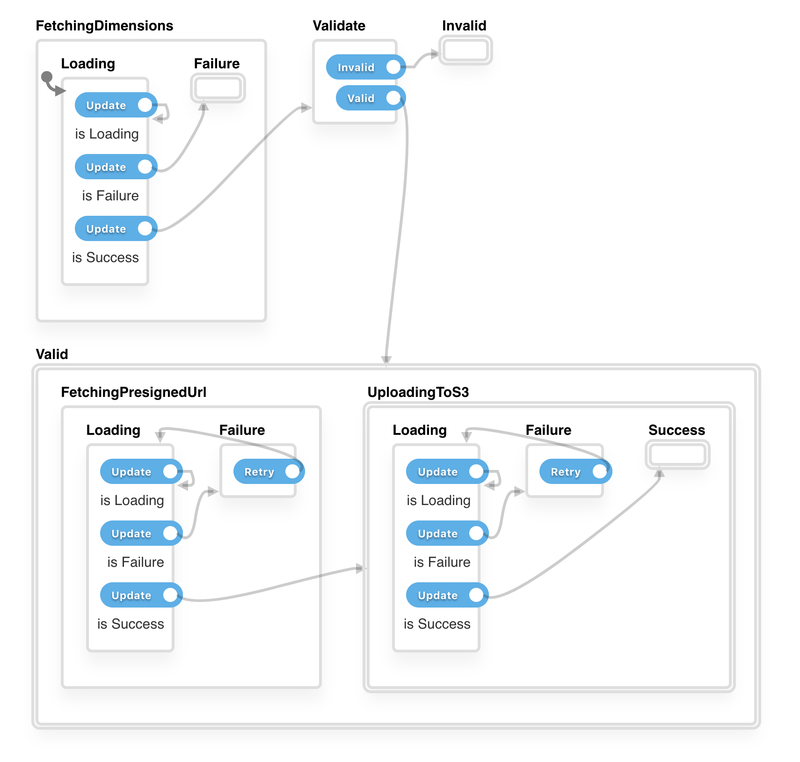 The uploader is built as a finite-state machine (FSM), using Unionize to define the state and action sum types, Redux to define the state transitions, and redux-observable to perform side effects. David Khourshid’s talk “Simplifying Complex UIs with Finite Automata & Statecharts”. 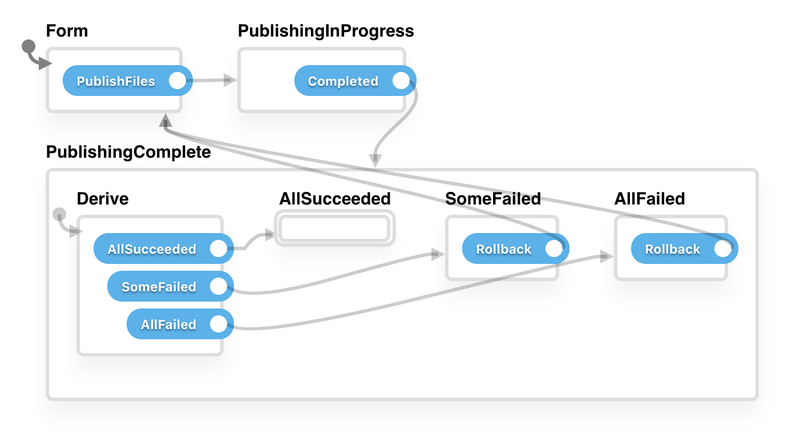 In this section, we will illustrate the uploader FSM as a statechart, and then we will link this with the designs by walking through a user’s journey of the uploader. The application begins in the Form state, with no files added. FetchingDimensions, Validate, Invalid, and Valid. The file FSM begins in the FetchingDimensions state. 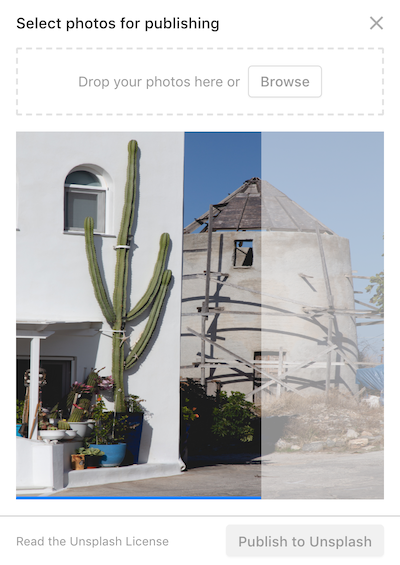 We fetch the dimensions by loading the image in the browser. Otherwise, we move on to validate the file (which we now know is definitely an image). This involves checking the image is not too large and has sufficient megapixels, for example. Otherwise, we transition into the Valid state which means we can (finally!) begin to upload the file. 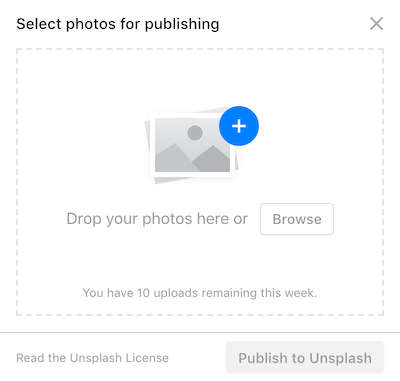 Uploading involves a sequence of two requests: FetchingPresignedUrl (read more about S3 presigned URLs) and then UploadingToS3. If any of these requests fail, they transition into their respective Failure states, where the user has an option of retrying them via the Retry action. Note: we enforce a limit of 10 uploads per session. If the user tries to add more than this, files over the limit will not be added, and the user will see a warning. 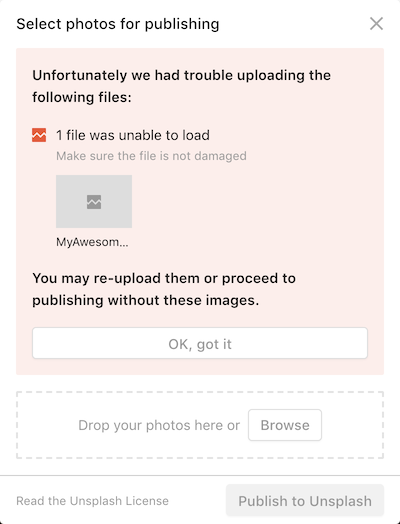 Once all added files are uploaded (all files are in Valid UploadingToS3 Success state) and the user does not want to add any more, the user may submit the form. When the form is submitted, the PublishFiles action is dispatched which causes the application to transition into the PublishingInProgress state. 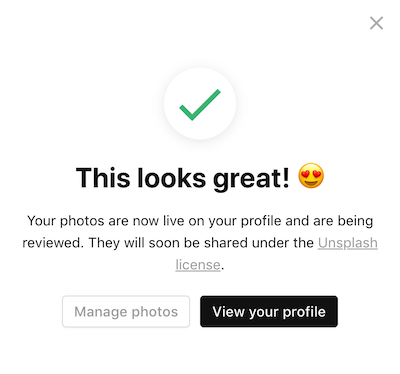 This is when we make a request to the API to instruct it to publish the files we previously uploaded to S3, which has the effect of making these photos visible on the user's profile. Once all files are published, the Completed action is dispatched which causes the application to transition into the PublishingComplete state. Depending on the result of the publish requests, the PublishingComplete state will transition into either the AllSucceeded, SomeFailed, or AllFailed inner state. 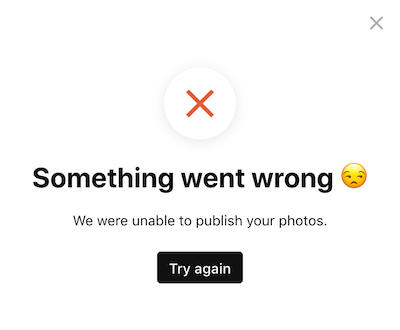 In the SomeFailed and AllFailed states, we give the user an option to retry publishing the failed images via the Rollback action which causes the application to transition back to the Form state. 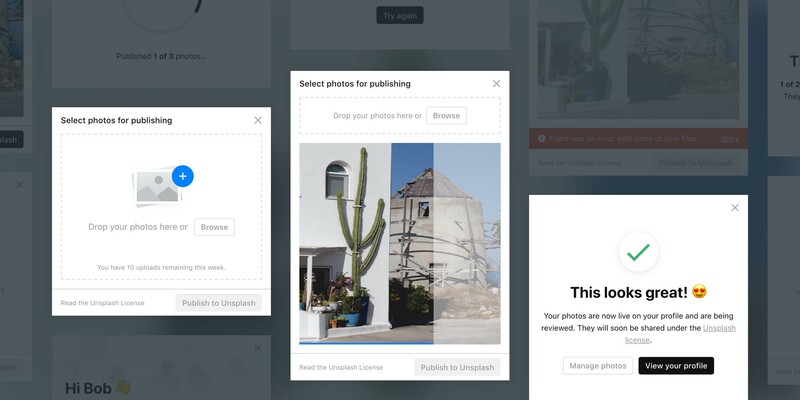 When we were building the uploader, we faced several technical challenges that did not have well established solutions, yet these challenges were not unique to this application. By sharing the details of these challenges, we hope that others may be able to benefit from our learnings — or maybe someone can point us to better solutions! Every time we make a request, we model the request state using a RemoteData type. This is a neat abstraction which lets us express a request as a FSM, so we can continue to reap the benefits of using FSMs all the way down our application's state. You can see these RemoteData types used within the file statechart above. For example, observe how the UploadingToS3 state contains the inner states Loading, Failure and Success. However, a request is never just a static value — rather, it changes over time. For example, it usually begins as NotAsked, then transitions to Loading, and then either transitions to Failure or Success. When the request begins, the Observable will emit Loading. Each time there is a ProgressEvent update for the request, the Observable will emit Loading along with the current progress. When the request completes: if it failed, the Observable will emit Failure<FailureData>, else it will emit Success<SuccessData>. We think this helper might have some legs beyond this application, whenever you need both Observable and RemoteData, so we are considering publishing it as a independent utility. If you're interested you can refer to the source here. Let us know what you think! We’ve previously written about how Redux can be used to build a FSM. However, one critical piece we didn’t touch on in that article is how to incorporate side effects into this architecture. Using reducers, we can easily describe what the next state should be when an action occurs. However, there is no clear way for us to trigger a side effect. 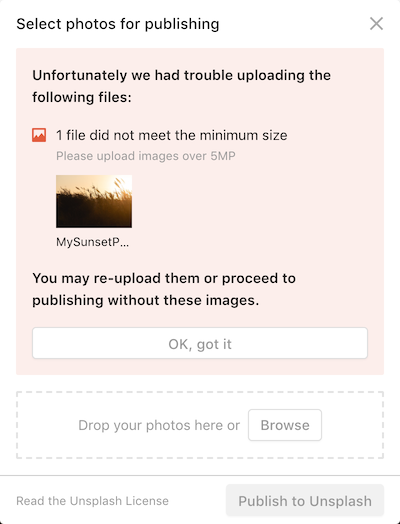 In this case, when we transition into the Uploading state, we want to trigger a side effect to start the upload request. The formal FSM terminology differs slightly: “actions” are called “events”. But much more significant is how this formal definition includes “actions” as something resulting from the reducer/transition function (in addition to the next state). Under this definition, there are two types of “actions”: events (e.g. a button click), which are fed into the reducer, and actions resulting from the reducer (e.g. an instruction to perform a HTTP request), which are fed into a function to perform the side effects. What if we could build on top of reducers to support this pattern? This is not a new idea! This is similar to how side effects work in Elm, and some plugins already exist to bring a similar pattern to Redux. We ultimately decided against using this pattern because it’s rarely seen or used in the Redux ecosystem, but we’re excited to see if this idea increases in popularity as more people begin to use Redux to model FSMs. The way we ended up solving this instead was by listening to the state changes in our epics and inferring when a new state was entered. There are other ways of implementing FSMs outside of the Redux ecosystem which do have solutions to this problem, but unfortunately we didn’t have time to fully consider these options. However, we were pleased with the progress we were able to make using our existing tools. If you’re interested in the ideas discussed here, we started a discussion which we’d love for you to join! One problem we ran into when using redux-observable is there appeared to be no clearly established pattern for working with dynamic list state. In a dynamic list, each list item has its own local state and set of side effects. In our case, we have a dynamic list of file states, each of which has its own side effects such as the HTTP request to upload a file to S3. We can easily define an epic for any unit of state, but how exactly do we run an instance of this epic for each item in our dynamic list? To illustrate the problem, we’ll use a small example. Consider an application that displays a list of counters, with the option to add a new counter or remove an existing one. The application state will be modelled as a list of our CounterStates. When a list item is added, we need to subscribe to a new epic for the given list item. 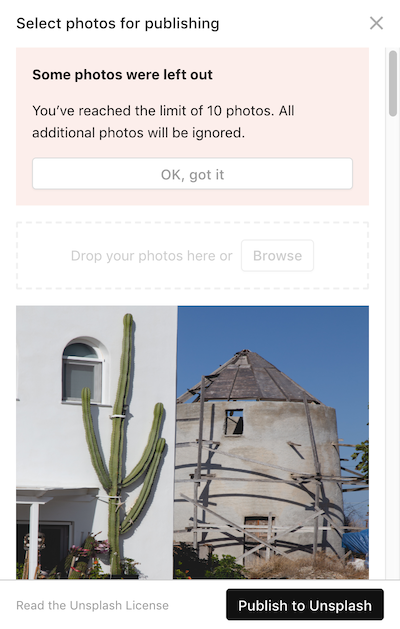 When a list item is removed, we need to unsubscribe from any existing epics for the given list item in order to abort any work, such as cancelling the interval in this example. This meets all the requirements, but there is a lot of ceremony involved, because we must define, dispatch, and handle the added/removed actions. These events are already provided by the state in the form of our state’s array/object additions/deletions — wouldn’t it be nice if we could just use that? When an item is added to the list, a new epic will be instantiated and subscribed to. When an item is removed from the list, the epic will be unsubscribed. We won’t go into detail here how exactly runListEpics is implemented, but if you're interested you can refer to the source. We think this helper might have some legs beyond this application, so we are considering publishing it as a independent utility. Let us know what you think! If you’re interested in the ideas discussed here, we started a discussion which we’d love for you to join! Sometimes it is necessary to artificially delay a transition from one state to another. In our case, this was necessary for the transition from the PublishingInProgress state to the PublishingComplete state. 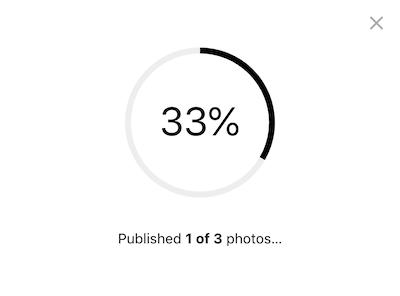 On a fast internet connection, the requests to publish each of the files—which happen as part of the PublishingInProgress state—are likely to complete very quickly. 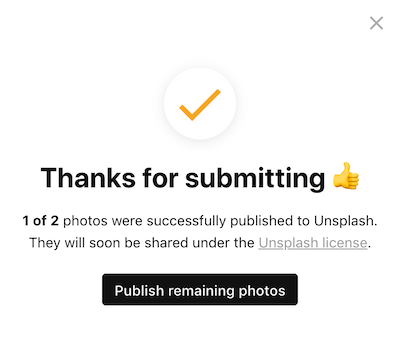 In this case, we don't want to immediately transition to the PublishingComplete state, in order to give the user a chance to observe the PublishingInProgress state and avoid the feeling of a jumpy UI. Thus, we need to artificially delay the transition to the PublishingComplete state. You can see this in action by referring to the source code here. Thanks to Sami, Seb, David, and Charles for their feedback and input on this article. 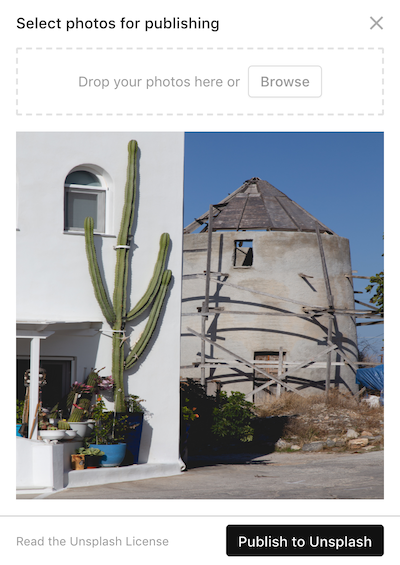 Don’t forget to check out the open source uploader prototype. If you like how we do things at Unsplash, consider joining us!